Do you have difficulty getting your dog to take his medications? Perhaps you try to hide a capsule in some peanut butter or a tablet in bread, only to have your dog chew it up and spit it out? Pill Buddy Naturals are your answer! We received Pill Buddy Naturals Chicken Formula and Pill Buddy Naturals Allergy Formula for review and have been testing them for the past few weeks. I've tried other brands of pill pouches before, only to be put off by their oily texture and unpleasant odor, so I was a bit skeptical about these. Well... I'm more than pleased to report that Pill Buddy Naturals are not at all like the others! They are not slimy (or smelly!) and are so easy to use for both capsules and tablets. You simply push the pill in and mold the Pill Buddy around it with a squeeze or two. Best of all, Pill Buddy Naturals are conveniently wrapped in packages of two to preserve freshness and prevent drying out. This certainly extends the shelf life of a package once you've opened it, making them economical as well. Additionally, Pill Buddy Naturals may also be fed to cats. 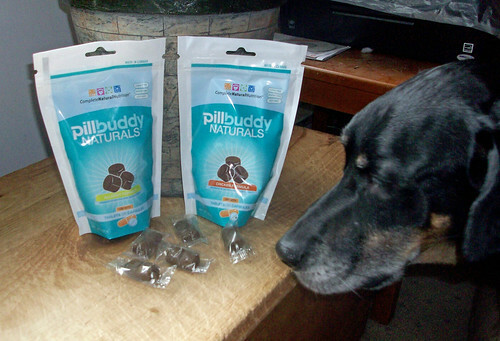 Both Zeus and Lola have tested Pill Buddy Naturals and have nothing but Woofs and 8 Paws Up to report to you! Zeus is my king of the "chew and spit" to get rid of pills, yet he takes his SAMe with ease twice a day now. I think he actually looks forward to SAMe time now! Pill Buddy Naturals truly make pill time rewarding and less stressful for both the dogs and humans. They are "marinated" in Nature's Sauce, an exclusive blend of natural ingredients which creates excellent mouth-feel and texture, providing a special surface that allows the dog to swallow it whole -- thus avoiding the dreaded "chew and spit!" Do you think Lola wants another? Available in two formulas, Chicken and Allergy, Pill Buddy Naturals are Made in Canada and available in packages of 30. Both formulas are corn free, wheat free and soy free. The Chicken Formula is made with Barley Flour, Chicken, Dried Apple Pomace, Vegetable Glycerin, Molasses, Vegetable Oil, Rosemary Extract, Citric Acid and Mixed Tocopherols. The Allergy Formula is made with the same wholesome ingredients, except duck replaces the chicken. Pill Buddy Naturals are going to be a staple in the Lapdog household for sure! If you have a dog on medication, check these out! As I stated above, I really love the fact that they come individually wrapped in packages of two. If you have to put your dog on a week's worth of antibiotic or give her an occasional aspirin, you won't have to worry about the Pill Buddies drying up in between uses. Check out Complete Natural Nutrition on Facebook and Twitter and get yourself a bag of Pill Buddy Naturals the next time you have to give meds to your furbaby! Too bad many dogs allergic to chicken are also allergic to duck (DIVA!). Nice thought though. Hey! My Human should have a look! She simply sticks my pills, twice a day, down my throat and dumb me, cause I get a treat, I swallow them. Thor was always great about taking his pills. But Thank Dog for peanut butter in his case. How is Zeus doing? I think about the poor baby often.